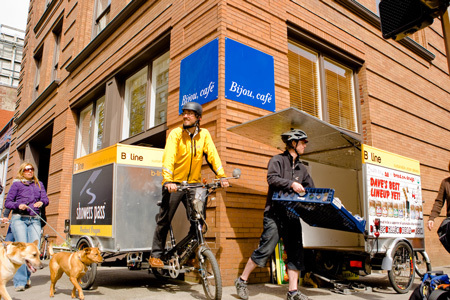 B-Line specializes in sustainable delivery to the urban core. We partner with businesses large and small to take care of their downtown and close-in delivery needs so that they don’t have to deal with the challenges of conventional trucks and vans. This, in turn, creates a more sustainable, livable community for all. 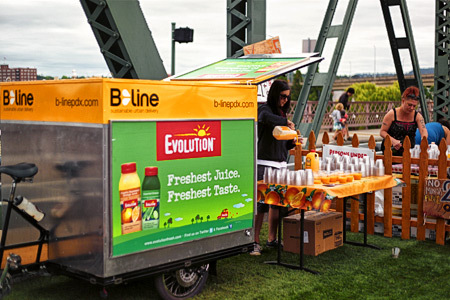 Founded in Portland, OR in February of 2009, B-line has begun to make our mark. Over 10,000 deliveries and 12,000 miles later we have reduced CO2 emissions by an estimated 54,000 pounds, delivered approximately 400,000 pounds of organic produce, provided hours of sustainable, eye-catching advertising for our partners, promoted the greenest beverage launch event to date, and put a smile on thousands of faces who suddenly realize what a tricycle can do. delivery: Whether dropping pallets at our warehouse in close-in southeast Portland or having B-Line come to your facility for pick-up, we streamline and simplify urban delivery for businesses. With over 55 cubic feet and a 600-pound capacity, our unique electric-assist cargo trikes offer eco-friendly, efficient delivery to close-in and downtown Portland. advertising and promotion: B-Line offers unique advertising and promotional opportunities for companies looking to align their advertising efforts with their core values. Eye-catching, mobile advertising space is available on the sides of our cargo box panels and our fleet of nimble trikes and friendly drivers are ready to go where the crowds are at a moment's notice to promote your products or events.